If you don’t yet have a Dutch Oven in your kitchen, it’s time to pick one up. This heavy-duty piece of cookware is one of the oldest and most classic styles around, and easily one of the most versatile – safe to use on both the stovetop and the oven, and perfect for making everything from hearty stews to fried chicken and even breads and cakes. Seriously: you can use a Dutch Oven to braise, boil, sear, fry – virtually anything. If you’re feeling adventurous, you can even use your Dutch Oven on a campfire. Name another pan you can say that about? Below, we’ll show you our 10 top picks for Dutch Ovens out there, why we like them and what earned them a spot on our list, as well as how they stack up against each other. That ought to help you learn everything you need to know about picking the right Dutch Oven for your kitchen. Below is a snapshot of the top 10 pans, continue reading for pros and cons on each one. Why Get a Dutch Oven? Dutch Ovens can be used to make pretty much everything, from soups and sauces to giant pot roasts. They come in handy when it’s time to bake bread, too, giving your loaf thick and crispy brown crust. And they are a no-brainer for making giant casseroles. This is because they are (generally) made of cast iron – the king of all cookware. Cast iron is a great thermal conductor and does an excellent job of distributing heat evenly through the entire pot; it also holds that heat well over long periods, and can get really, really hot. What does that mean? It means your food comes out a lot better cooked on cast iron than it does on other pans. The evenly-distributed heat means that food is cooked evenly all the way across. Meats sear faster and better, coming out perfectly browned; cast iron over high heat is pretty much a requirement for good steaks. And the crispier and more browned the meat is, the more potential you’ll have for deglazing; suing all the crispy, tasty bits of meat left on the pan to create even tastier gravies, stews and soups. Cast iron is also the material of choice for making soups and stews – which require simmering and braising. Since it holds heat so well, cast iron is excellent at simmering stocks and stews at low temperatures for hours on end. Long simmers gives the starchy and fatty ingredients in stews time to break down, creating thicker and more flavorful broths. You can use a regular old stockpot or a Crock Pot for that, too – but cast iron Dutch Ovens are far better at braising and can be stuck right in the oven if need be. All real Dutch Ovens are made from cast iron, so we only selected cast iron models for our list. Cast iron is heavy-duty and strong, works on all cooking surfaces (electric and gas stove top, induction, cooker, and oven) without a hitch, and is the go-to surface for excellent searing and baking; foods are evenly-cooked and perfectly-browned foods all the way around. Thicker iron is usually better than thinner, especially when we’re talking about cast iron. The thicker the metal, the longer it will take to heat up, but the more even and efficient the heat distribution will be. This is especially important for the base of the pot, which conducts heat from the stovetop. The side walls usually taper slightly to cut down on weight. You may see Dutch Ovens made from stainless steel or aluminum; these are fine pots in their own right but are more akin to regular stockpots than a true Dutch Oven. Most of the Dutch Ovens we recommend have porcelain enamel coatings on both the interior and exterior. Cheap enamels chip and flake easily. Some even bubble on high heat. But quality ones (from brands like Le Creuset, Staub and Landhaus) will last years of repeated use, with nearly a scratch to show for it (it helps to avoid using metal utensils, which can scratch the surface). Not the first thing people think about, but an important consideration. 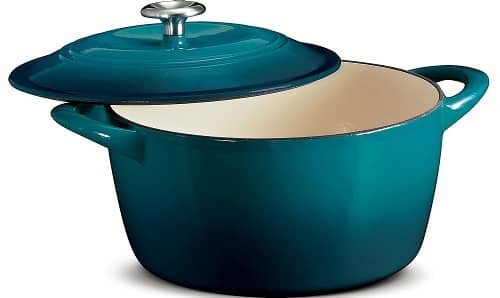 The best Dutch Ovens have cast handles large enough for grabbing securely with oven mitts on without danger of dropping. Small ones can be annoying and uncomfortable. Just as handles can, a pot’s weight can make or break your experience; the lighter the better. We prefer our Dutch Ovens to tip the scales at less than 15 pounds – which is still heavy for many people. The lightest we tried was the Le Creuset, which weighed only about 13 pounds. Lodge’s Porcelain Enameled model was the heaviest at a whopping 18 pounds. Most of the Dutch ovens we’ve tried out are 7-quart pots, but a few were held only 6 or 6.5 quarts. We prefer the larger size as they are taller and better for making soups and stews. More important than high walls, however, is how large the base is and how sloped the walls are; slightly-sloped or flared sides create a wider cooking surface inside, while steep and narrow walls can be almost claustrophobic when cooking large roasts or browning lots of meat or potatoes. This enameled cast iron Dutch oven comes with 6 quarts of capacity and dimensions measure 4 ½ inches deep by 10 ¾ inches in diameter. It has porcelain-enamel chip-resistant finish and is made of cast iron with loop side handles for secure and safe transport. You can rest assured of its longevity and durability with assurance of lifetime warranty. It is also oven safe to resist heat up to 500 deg. F. It comes with handle and self-basting cover with capacity to retain heat, moisture and healthy nutrients of the food. It is recommended to hand wash this Dutch oven with silicone or wood utensils. With Cuisinart Chef’s Classic line, cast iron has absolutely redefined its look. It comes in different sizes and shapes. This appealing and durable cookware is best to use in the oven, on the stove, or under the broiler. It retains heat and distributes it every time. You can easily sear steaks, simmer entrees, or braise. It comes with attractive color optons and enameled finish. You can buy it for different cooking methods, such as grilling or searing to simmering or braising in casseroles. It retains heat properly and gives best results, be it in the broiler or on the stove. 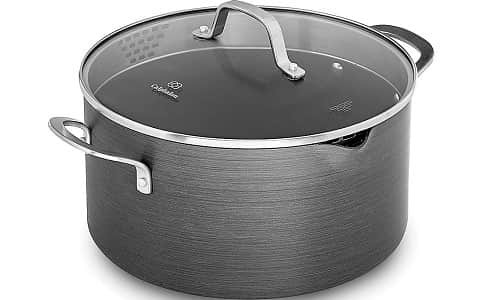 This Dutch Oven from Calphalon comes with warranty for 10 years. It has 2 different layers of nonstick interior and it has silicon handles to remain cool while cooking. It can heat up around 400 Deg. F and has been made oven safe. It comes with tempered glass cover due to which it is easy to keep track on cooking. Easy to release food from non-stick interior and cleaning up is very easy. 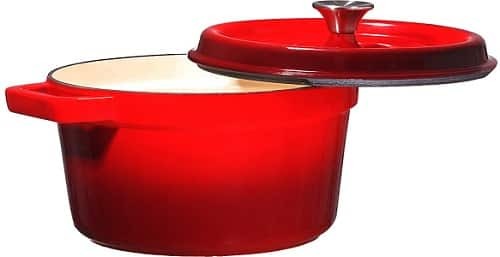 Bruntmor 6.5-inch Enameled Cast Iron is the fiery red enameled cast iron Dutch oven is the perfect cookware for your kitchen and campfire. It comes with 6.5 quart of capacity and it will be delightful and entertaining for your guests and family with a lot of food. It retains heat well band saves energy while cooking with lower temperature. You can cook from bread to stews. It is heavy duty and top quality gift for any camper, newlyweds and home cook. 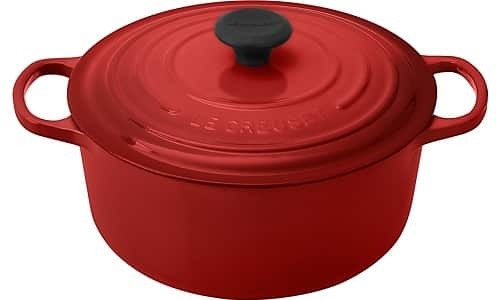 This Dutch oven from Le Creuset is designed to improve the cooking in your kitchen as it distributes heat evenly and locks in proper moisture level. The handles are designed ergonomically and come with world-class interior enamel which is easy to clean and resists chipping. It blends with recent innovations well. The best part of this Dutch oven is that it has 45% larger handles for smooth grip. It uses sand colored enamel to resist chipping and wear. 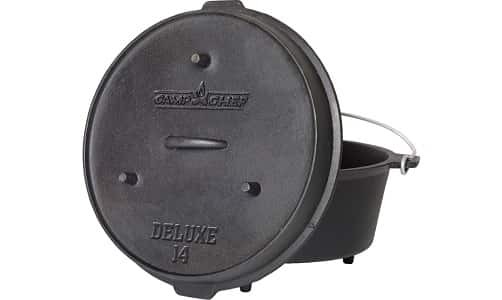 Make your favorite and flavorful meals with Camp Chef DO-14 Pre-Seasoned Dutch oven. Cook your favorite fruit cobbler and roasted meats. All you need to turn lid off to cook your delicious bacon, eggs, or pancakes and replace lid and cook the potatoes you love for your next flavorful meal. 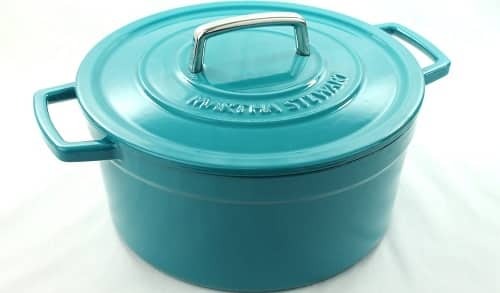 Prepare hearty stews, soups, pot roast and chili with this enameled cast iron Dutch oven from Tramontina. The 6.5 quarter is the generous and large size to cook your delicious food for whole family and prepare one-pot meals at its best. When it comes to slow cooking, cast iron is the best choice as it distributes heat evenly and eventually. It is an ideal option to brown chicken, tenderize meats, sauté onions, steam veggies, and simmer sauces. You can also make spicy stews and chili. This versatile pod is also the right choice for baking without its lid. In Alsace, France, the journey for Staub was started. This region is rich in food, history, and craft and is also known for healthy one-pot delicacies. Since 1974, Staub has been manufacturing the world-class cast iron products or aspiring and professional cooks. 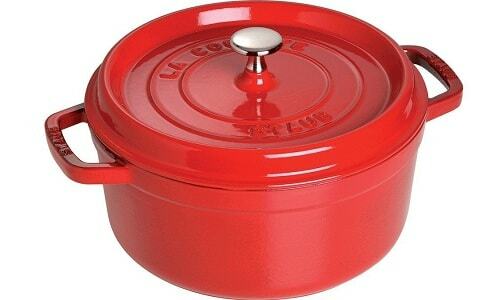 This French oven from Staub is timeless piece for roasts, stews, casseroles, soups, and other one-pot recipes. In this signature “La Cocotte” French oven, Staub has successfully retained its tradition. It is the first choice of some of the best chefs in the world. 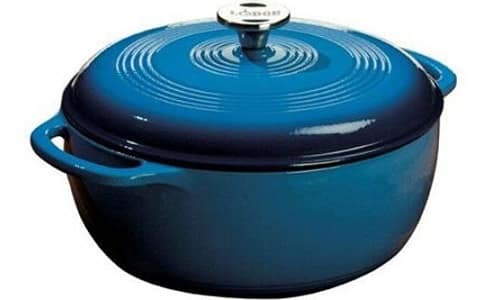 This blue enameled cast iron casserole is a versatile Dutch oven which is a good choice to brown meats and you can bake your favorite dishes. It is made of heavy-duty metal which is known to distribute heat well and lock moisture to braised roasts and slow-cooked stews. This captivating enameled cast iron oven is easy to prep and present food, with well sized handles for cozy, secure grip. The lid has condensation rings underside to redistribute and condense the moisture. This durable, cute cast iron cookware from Anolon Vesta will take you to new level of culinary experience and taste. 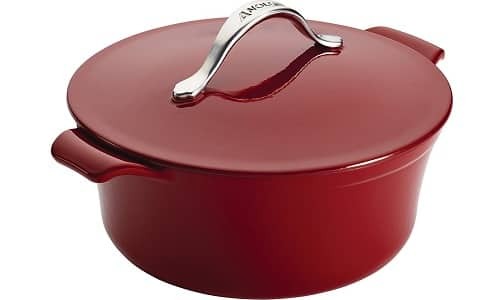 Anolon Vesta cast iron casserole is a casserole known for its great heat retention and absorption with great stovetop-to-table style and durability. It is best suited for all cook tops, such as induction. It is an elegant Dutch oven to prep your favorite potato stews or chicken. -> Let the hot pan to cool down to before you wash and to clean the Dutch oven which has enamel coating. Don’t clean it in extremely cold water because enamel coating might be affected due to thermal shock. -> If your Dutch oven has food leftovers stuck in it, simply soak it in warm water for up to 15 to 20 minutes to remove debris. -> Let your Dutch oven to dry and keep away from steam to avoid the build-up of moisture. -> Check knobs and handles regularly as you need to tighten them over time. -> It is also important to replace knobs over time as they wear out. Leave the pot on the oven for one hour until its smoking. Marinate, bake, fry, and boil almost any food with this Dutch oven. It is best to use over the stove, put it in the oven or use as outdoor cook, or in the grill. 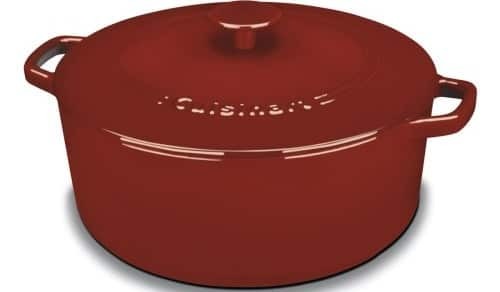 If you are brand conscious, we recommend you to go with Calphalon or Le Creusets. These are the best quality ovens. We hope, you’ve liked the above buyers’ guide and best Dutch oven reviews.